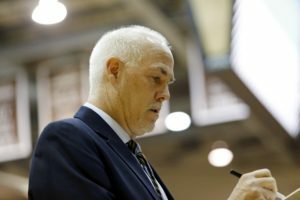 St. Bonaventure’s loss at Rhode Island Wednesday followed the basic script for many of their road games this season. The Bonnies started the contest with energy, jumping out to an early 12-4 advantage. The Rams began to come back and took their first lead of the game with 7:27 remaining in the first. The teams more or less traded baskets for a while, until Rhody went on a 13-0 run to end the half with a 34-20 lead. SBU made a typical second half surge, outscoring URI over the final 20 minutes and coming as close as seven, but the Bonnies didn’t make enough plays or stops to win. Rhode Island won 75-63 as Bona fell to 6-11 overall, 2-2 in the Atlantic 10 and 0-6 on the road this year. Player of the Game: Tyrese Martin, Rhode Island. Martin’s contributions over the last 5:26 of the first half: two free throws, a three-pointer, a layup, a dunk, an offensive rebound and an assist. Martin and Fatts Russell led all scorers with 18 points each, while Martin added five rebounds and three assists. The freshman has now scored in double figures in all four conference games. He is playing his way into the Rookie of the Year conversation. Honorable mention: Fatts Russell, Rhode Island (18 points, five assists), Cyril Langevine, Rhode Island (14 points, eight rebounds), LaDarien Griffin (17 points, four rebounds), Dominick Welch (12 points, a career high). Stat of the Game: Wednesday was the third game this season where both teams committed more than 15 turnovers. Rhode Island committed 16 turnovers which Bonaventure converted to 21 points. Bona committed 18 turnovers which Rhody converted to 20 points. The Bonnies are now 1-2 when both teams turn the ball over at least 15 times. Injuries strike again: St. Bonaventure’s run of having 11 healthy scholarship players ended when junior Jalen Poyser suffered a head injury in practice on Monday and did not travel with the team. The health issues continued when Nelson Kaputo suffered a concussion in the first half. Kaputo played 14 minutes, making a three and recording both an assist and a rebound. Stretch of the Game: The 13-0 run turned a one-point URI lead into a 14-point cushion entering the locker rooms. Bona committed three turnovers, missed three three-point shots and also missed a layup during that stretch. The Rams didn’t turn the ball over at all and make six of seven attempts.